Using public transport is stressful at the best of times but when you're travelling with children or pregnant, it's can be unbearable. 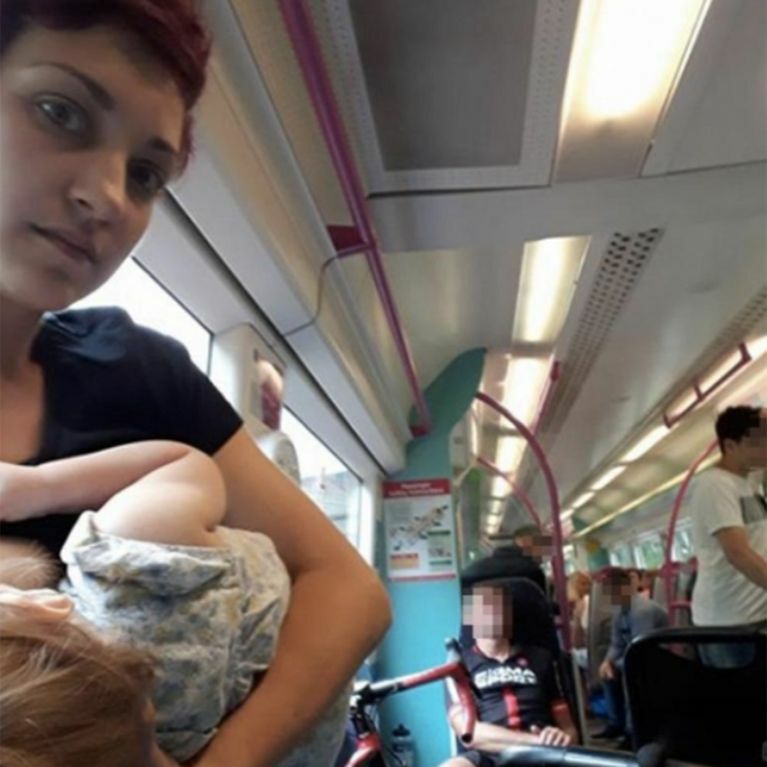 Spare sympathy for this mother, then, after she was forced to breastfeed her baby standing up on a packed train. That's right, apparently tired cyclists and guys engrossed in their games of Candy Crush deserved those seats that little bit more. An angry mother has hit out at passengers after she was forced to breastfeed her baby standing up on a packed train. Bryony Esther, from Leigh-on-sea in Essex, posted he photo of her trying to breastfeed on Facebook and encouraged others to share it too. In the caption she called out the 'lovely bunch of charmers' on the train who were 'giving more priority to their suitcases and rolling joints'. She goes on to say, "Plus the cyclist with a fancy bike that keeps rolling into me, sat in the disabled seat." Bryony then clarified in the comments underneath that, despite not posing the question and asking commuters to give up their seats, it was obvious she was breastfeeding. "I didn't ask the exact question but I had plonked my 5-year-old on a seat as we got on the train so I could see to my baby but was told quite rudely 'this seat is taken' then saw they were doing drugs so quickly moved." Since posting the photo, Bryony's post has been shared more than 23,000 times with plenty of commenters offering their support. One Facebook user wrote, "Nothing shocks me anymore. Some people are just plain ignorant and I am so proud of you Bryony Esther for taking a stand and making this public. You're a hero." Come on people, it's called priority seating for a reason and our guess is, a mum trying to breastfeed her baby is probably less likely to be able to stand up than say, a grown man building a virtual farm or rolling a spliff... maybe. Women Say 'Sorry' HOW Many Times A Day?